Thanks to the great folks at Madison Square Garden, I have a last minute giveaway opportunity to share with you all! 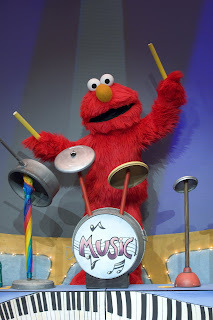 One lucky reader will win a "Family Four Pack" of Ticket Vouchers, worth almost $150, to Sesame Street Live: Elmo Makes Music at Madison Square Garden's WaMu Theater in New York City. 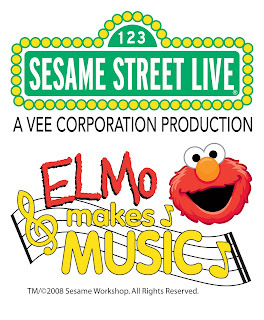 "Sesame Street Live 'Elmo Makes Music' is coming to the WaMu Theater at Madison Square Garden in New York City! Mark your calendar for a musical event like no other - monsters making music! Elmo, Zoe, Big Bird and all their Sesame Street friends are taking to the stage to share their love of music. Count along with The Count, visit Elmo's World, do the Crumb-A-Rumba with Rosita, and much more!" Because the tickets are vouchers, the winner can go to the show of their choosing (depending on when the tickets are received). Deadline to enter is 11:59 EST, Wednesday, February 11, 2009. Winner will be selected at random using Random.org. Because of the fast turnaround, winner must respond to notification within 24 hours or another winner will have to be selected. You can also take advantage of a special promotional offer. Simply click here and enter the code SSLEMM to receive 25% off your ticket order. I'm opting out of the contest but did want to comment on how great this show would be! I love Sesame Street! I live in Manhattan and have NO plans for this weekend with my daughter...who just went off to kindergarten in her Elmo backpack...I want to win so badly! My kids would have so much fun and my little one has never been to MSG! Oh! This would be perfect for my daughter! Her 2nd birthday was this past weekend and I've been dying to take her somewhere special now that the weather is getting nicer. my wife and kids would love this! Thanks for a great giveaway! I have my two nieces this week as their mother had an emergency trip, this would be a treat for them.